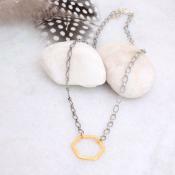 Love comes in many shapes ~ especially hexagonal! 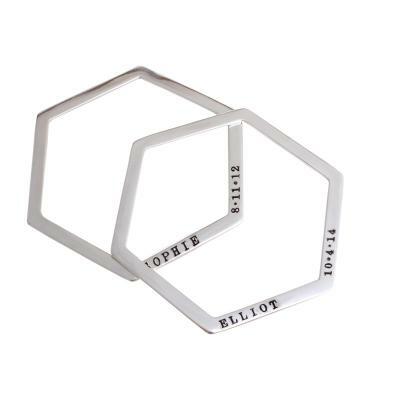 We love this stackable bracelet which can be personalized with up to 6 names or dates. Bracelet comes in one size, medium, and slips over the wrist. 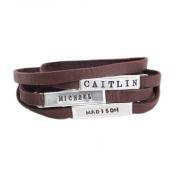 With this personalized bracelet you will have all of your family wrapped around your wrist at all times. Have each family member's name, or just the names of children or grandchildren stamped on this bracelet and maybe their birthdates. Stamp each child/grandchild and birthdate. Choose meaningful words or dates. Stamp you and your partner's names and a wedding date or important date. 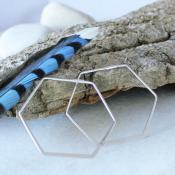 Be creative and design a bracelet that is meaningful to you. The price listed is for one . You can have up to 6 outside stamps by choosing the number you need in the drop-down box. Dimensions: The width of the bracelet is approx. .2" and all silver is sterling,. 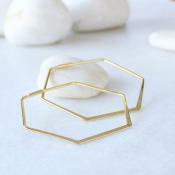 This is a bangle bracelet which slides on the wrist. It does not have a clasp. We are unable to change the size of the bracelet once it is ordered so please understand the bracelet is a medium and measures 2.4" at the smallest point and 2.8" at the widest. All names will be stamped in the positions shown in the examples. The price will change according to how many stamps you put on the bracelet. Using the block font, there is an 8 character limit. If you need more than 8 characters we can do it using the Lizzy font but you will need to call us at 978.792.2555. Because these bracelets are customized, all sales are final.